Returns the Gaussian fit of a data set using a specific fitting method. Initial guesses of the amplitude, center, standard deviation, and offset for use in the iterative algorithm. If initial amplitude, initial center, initial standard deviation, or offset is NaN, this node calculates the initial guess automatically. Initial guess of the amplitude. Initial guess of the center. 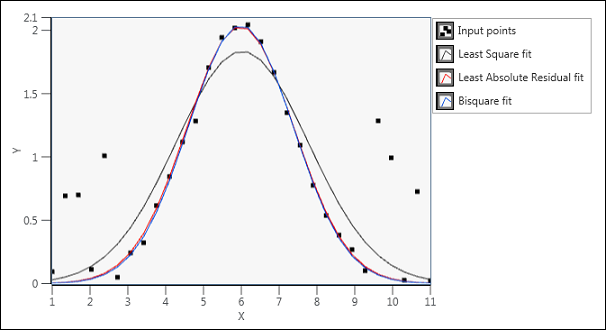 Initial guess of the standard deviation. Initial guess of the offset. This input changes to y when the data type is an array of double-precision, floating-point numbers. An array of dependent values representing the y-values of the data set. This input changes to signal when the data type is a waveform or an array of waveforms. An array of independent values representing the x-values of the data set. This input is available only if you wire an array of double-precision floating-point numbers to y or signal. An array of weights for the data set. Value that determines when to stop the iterative adjustment of the amplitude, center, standard deviation, and offset. If tolerance is less than or equal to 0, this node sets tolerance to 0.0001. For the Least Square and Least Absolute Residual methods, if the relative difference between residue in two successive iterations is less than tolerance, this node returns the resulting residue. For the Bisquare method, if any relative difference between amplitude, center, standard deviation, and offset in two successive iterations is less than tolerance, this node returns the resulting amplitude, center, standard deviation, and offset. Upper and lower constraints for the amplitude, center, standard deviation, and offset. Lower bound for the amplitude. Default: -Infinity, which means no lower bound is imposed on the amplitude. Upper bound for the amplitude. Default: Infinity, which means no upper bound is imposed on the amplitude. Lower bound for the center. Default: -Infinity, which means no lower bound is imposed on the center. Upper bound for the center. Default: Infinity, which means no upper bound is imposed on the center. Lower bound for the standard deviation. Default: -Infinity, which means no lower bound is imposed on the standard deviation. Upper bound for the standard deviation. Default: Infinity, which means no upper bound is imposed on the standard deviation. Lower bound for the offset. Upper bound for the offset. Least Square 0 Uses the least square method. Least Absolute Residual 1 Uses the least absolute residual method. Bisquare 2 Uses the bisquare method. The bisquare method of fitting finds the amplitude, center, standard deviation, and offset using an iterative process, as shown in the following illustration. yi is the ith element of y or the ith data value in a waveform. Offset of the fitted model. Y-values of the fitted model. 1D array of double-precision, floating-point numbers. Weighted mean error of the fitted model. This node finds the values of a, μ , σ , and c that best fit the observations (x, y). 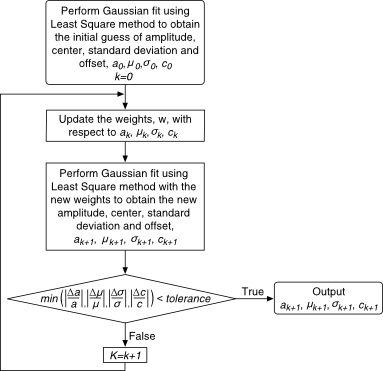 The following illustration shows a Gaussian fit result using this node.